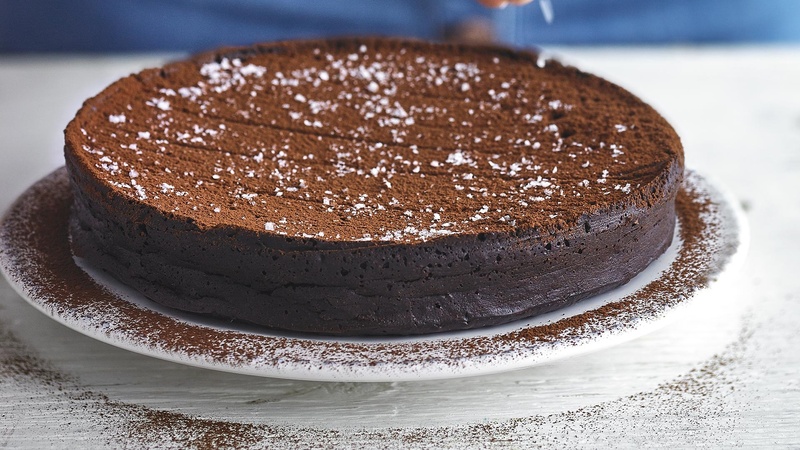 This torte is wickedly rich and indulgent, which in my eyes is exactly how a cake should be," Dudley says of this family-favourite recipe that's conveniently both impressive and easy to make. If sea salt isn't your thing, feel free to omit it – replacing it with espresso powder works brilliantly, or you could just leave it as straight chocolate. We bet this cake would go down a treat with a good, strong cup of coffee or tea. Preheat the oven to 160°C, lightly grease the base of a 22cm springform cake tin and line with baking parchment. Lightly grease the parchment, too, and sprinkle over a little sugar, shake the tin to evenly disperse and tip away the excess. Double-wrap the base and sides of the outside of the tin with tin foil – you will be baking the torte in a bain marie, so you want to ensure no water gets into the cake during cooking. Take a deep roasting tray in which your wrapped cake tin fits nicely. Melt the chocolate and butter in a pan over a low heat, stirring frequently. Remove from the heat when most of the chocolate has melted and there are just a few small pieces left. These will continue to melt as the chocolate cools. In a separate, medium-sized bowl, whisk the eggs and sugar using an electric whisk for about 2 minutes. Add the vanilla, sea salt and cacao/cocoa and whisk again to combine. Gradually pour in the melted chocolate, changing the whisk speed to the slowest setting. Pour the mix into the tin and give the base a few flicks with your index finger to remove any air bubbles. Placing the tin on a flat surface and giving it a gentle wobble can also help. Fill a kettle with water and boil. Place the tin into the roasting tray and slide the tray onto the middle rack of the oven. Pull out the rack as much as you can without putting the cake into slipping danger and slowly pour in the boiling water from the kettle until it comes to about 2cm up the side of the tin. Bake for 45-50 minutes or until the cake has set but the centre is still soft. Carefully remove from the oven, making sure you don't splash any water into the cake, then slowly draw the tin out of the water and place on a flat surface lined with a tea towel. Peel the foil away from the tin, again taking care as there may be a few leaks which will be very hot, then place the cake in the tin on a wire rack to cool. To serve, release the sides of the tin and invert onto a plate. Dust the cake with some cacao or cocoa powder and sprinkle with a pinch of salt – sprinkle from a good height to get a nice even fall of salt. I like to serve this with some good cream or yoghurt, and a few berries on the side. I love the sharpness of redcurrants, but for a sweeter option, strawberries or raspberries work too – just choose whatever's in season.